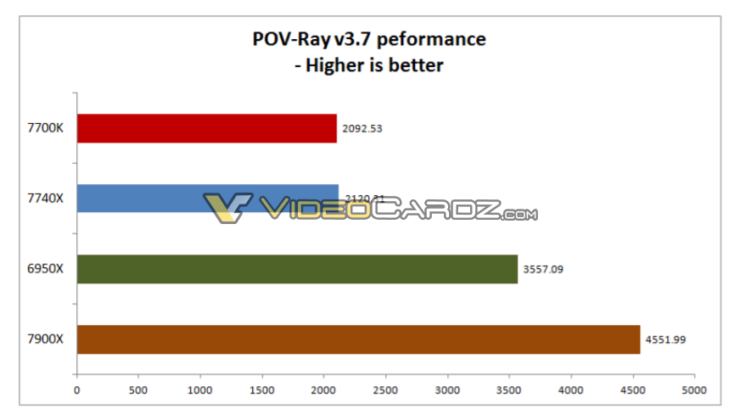 Overclocking on Intel’s Core-X series that includes Skylake-X and Kaby Lake-X chips has been detailed by Videocardz. The data shows that the upcoming processors feature great overclock potential but require good cooling solutions to maintain optimal thermals. 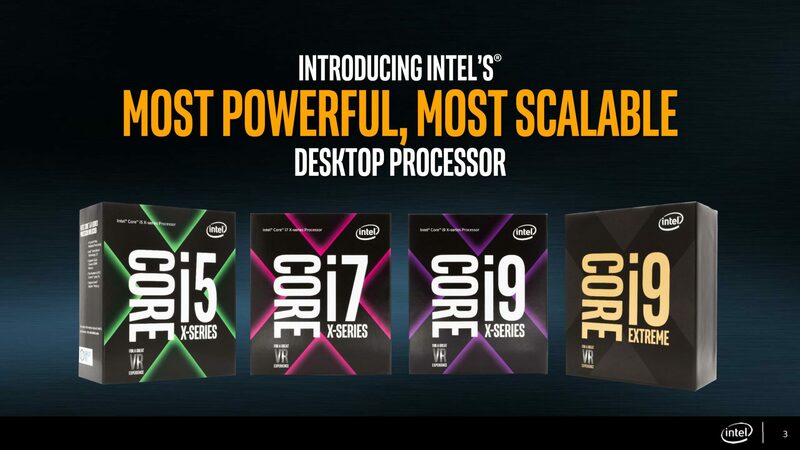 The Intel Core-X family including Skylake-X and Kaby Lake-X chips will be launching in the coming week. They will include processors ranging from 4, 6, 8, 10 cores while 12, 14, 16 and even 18 core options will be added later in Q3 2017. Yesterday, we got to see some of the first reviews of Intel’s Skylake-X Core i9-7900X processor and today, their overclocking capabilities have been detailed. 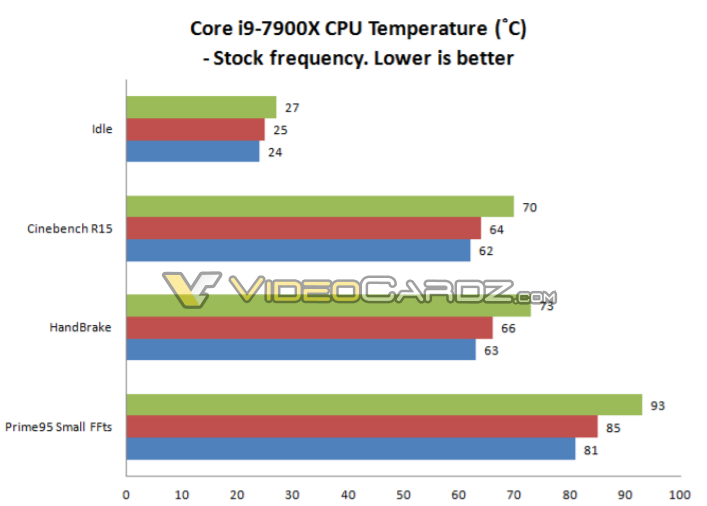 Videocardz managed to get their hands on an official reviewers guide which not only details the overclockability of the upcoming chips but also how different cooling solutions affect the thermal performance on the new HEDT chips. 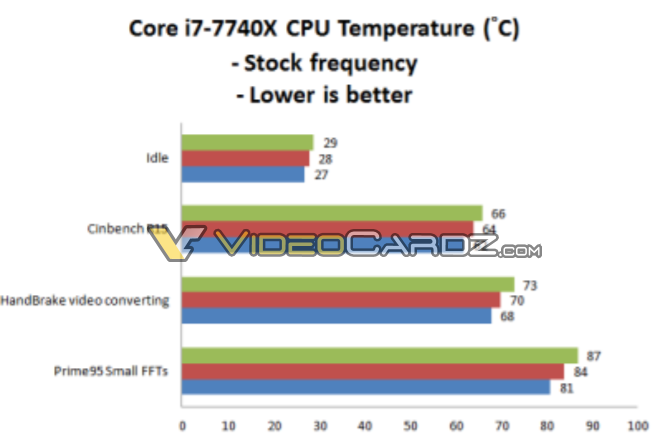 In charts posted below for the Core i7-7740X and Core i9-7900X, you can note three sliders. The green slider is for air cooling, red is for the Cooler Master Liquid 240 while blue is for the Corsair H110. Intel has recommended that overclockers or even stock users should aim for AIO liquid cooling solutions as they provide better thermal performance on Core-X chips compared to air coolers. Users who plan to use custom loop liquid cooling solutions should get even better results. In the temperate charts, we can see that both chips display temperatures of mid 60s to mid 70s in the performance benchmarks while going north of 90C on an air cooling solution and around 80C on high-end liquid cooling solutions in long term load scenarios. Both chips here are tested at stock frequencies so overclocking will definitely make a big impact as it involves voltage modification that will lead to higher temperatures. 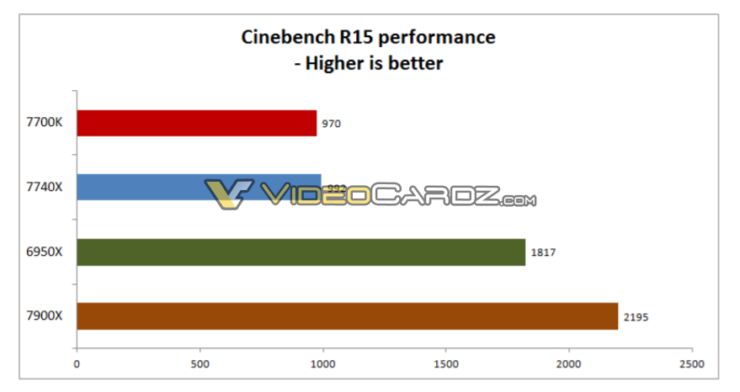 But there’s good news when it comes to overclocking with custom voltages. 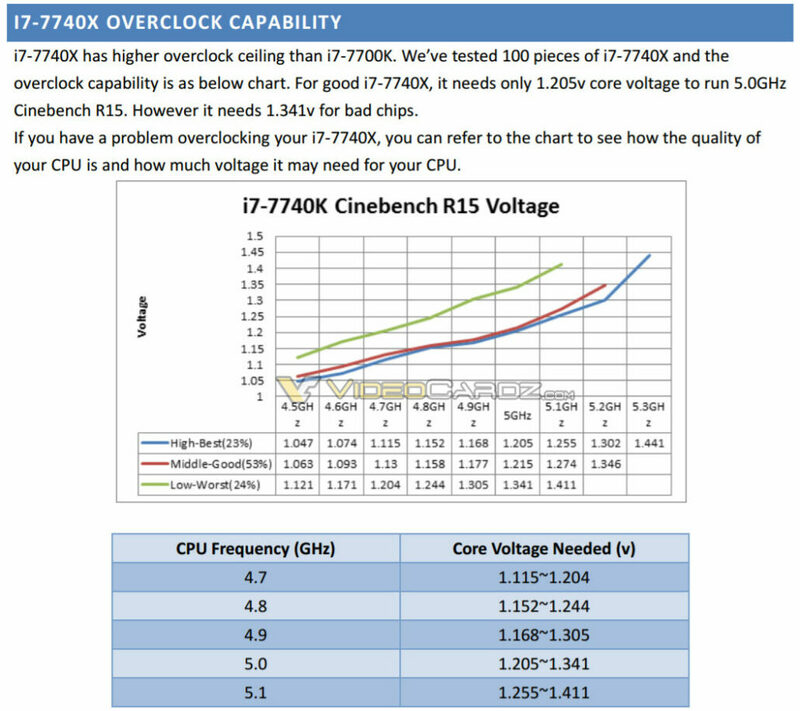 Intel has also detailed how well their Core i7-7740X (Kaby Lake-X) chip overclocks. From a sample size of 100 CPUs, up to 75% of the chips were able to achieve an overclock of 5 GHz with a small voltage bump of 1.205V. 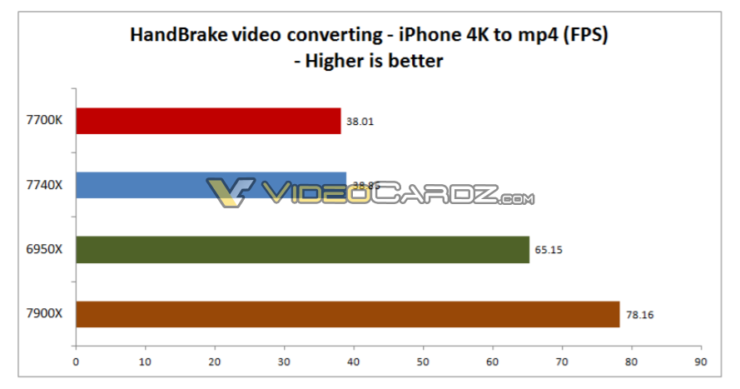 The remaining 24% were not quite as good and required 1.341V so most buyers will be looking at good overclocking chips while some unlucky consumers may get a bad chip. Slightly higher voltages on the good chips (~1.255V) can lead to even higher overclocks of 5.1 and 5.2 GHz which will be impressive however, as pointed out earlier, you will require some good cooling solutions. 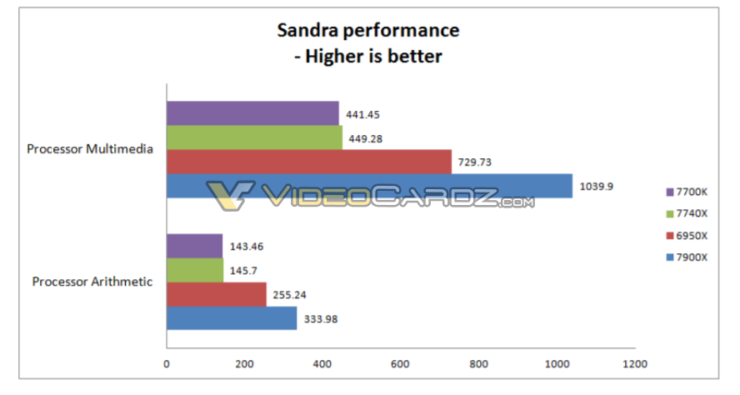 Finally, we have some stock performance comparisons of the Intel Core i7-7740X versus Core i7-7700K and the Core i9-7900X versus Core i7-6950X. While the Kaby Lake-X chip shows limited gains in performance, the Core i9-7900X blows away the Core i7-6950X which is very impressive at the former costs $700 US less. 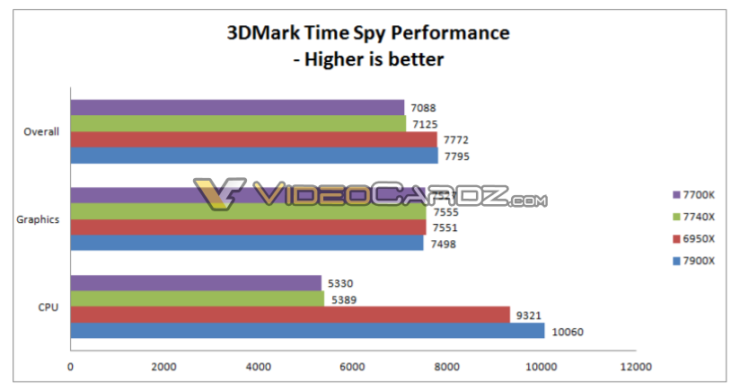 Intel’s board partners are also tuning the performance on daily basis as cited by many hardware reviewers so we can see much bigger performance gains when more reviews hit in the coming week compared to the ones showcased earlier.